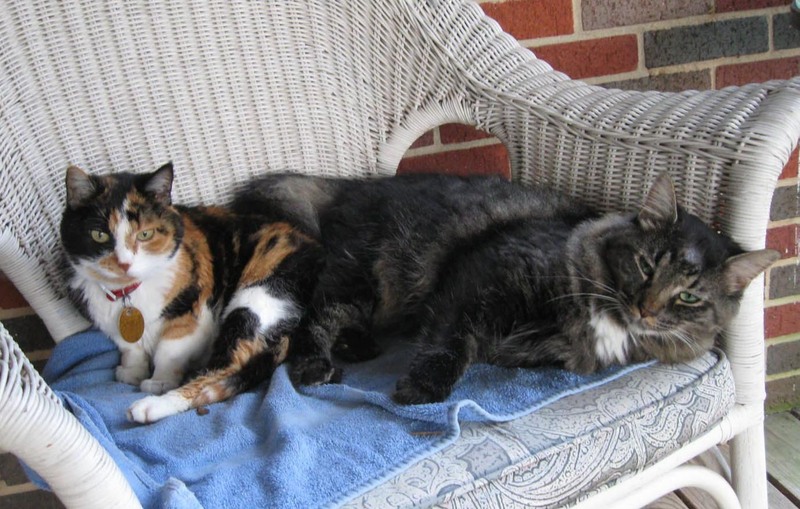 China (left) and Lucy, the extra kitty. For those of you who have pets, you know they are part of the family. Being so, they give and receive Christmas gifts, too. (Yeah, you mommies and daddies with furry, 4-legged kids know what I mean.) Our kitty, China, always gives great gifts, and they are often very partical. 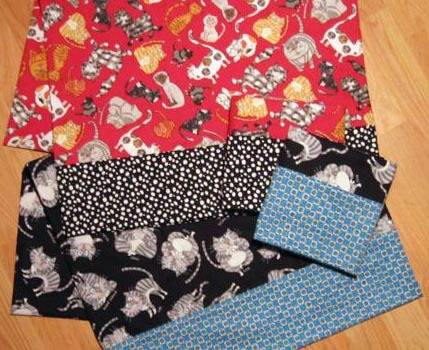 This year, China and Lucy (our part-time kitty whom we co-parent with our neighbors) asked me to help them make kitty pillowcases for their people parents. Lucy (he is a boy kitty) wanted to make pillow cases for his other mommy, Betty. So, here is how the three of us (China, Lucy and I) made their Christmas gifts. 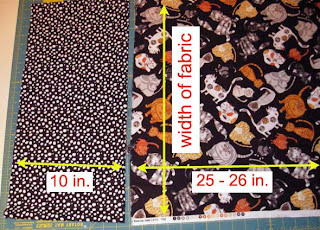 Choose two coordinating fabrics. 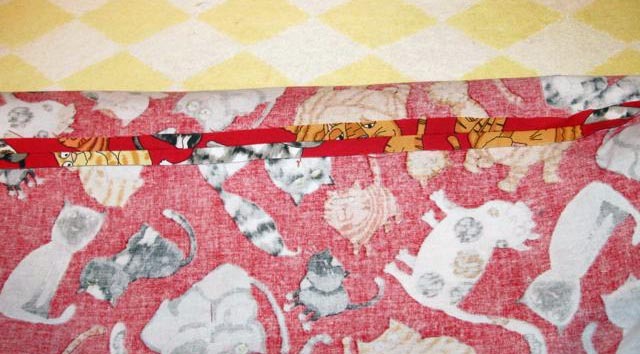 If the fabrics have pictures of kitties, kitty paw prints or kitty toys, so much the better! You need 1.5 yds. 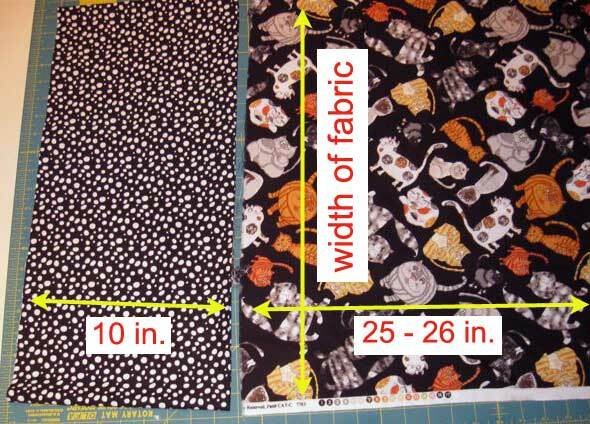 of the main fabric and 3/4 yard of the contrast fabric to get a set of two regular size pillow cases. 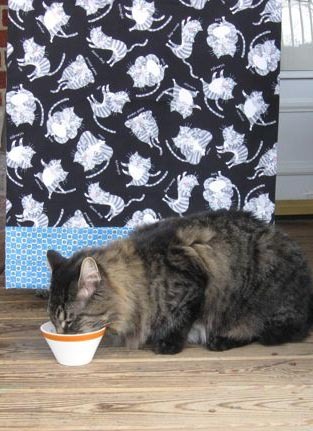 China and Lucy prefer 100% cotton quilters fabric. They recommend to pre-wash and iron the fabrics before you start to cut and sew. 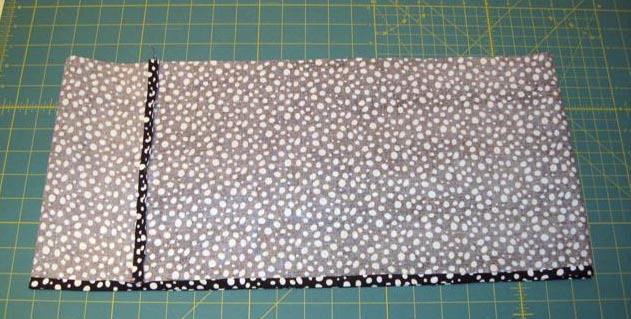 For each case, cut a 10" x WOF (width of fabric) strip of the contrast fabric. This will be the band. 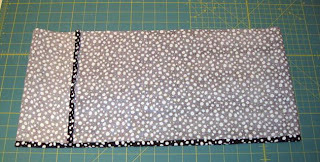 Also cut a 25" x WOF of the main fabric (25" or 26" inches long depending on how much fabric you have after pre-washing). Trim off the selvedges so both fabrics are the same width. 10" pillow case band. Press open seam. Turn up hem. With right sides together, sew the short sides of the band together to create a wide tube. 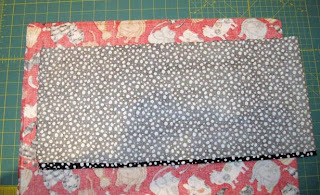 We used a quilter's quarter inch sewing machine foot to sew a 1/4" seam (you could use 3/8" or 1/2" if you want). Press the seam open. 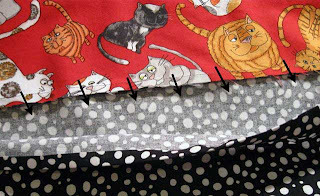 Then, press up about a 1/4" hem on one long side of the band. The body and band with side and bottom seams sewn. Trim and bevel the corners of the body to reduce bulk. 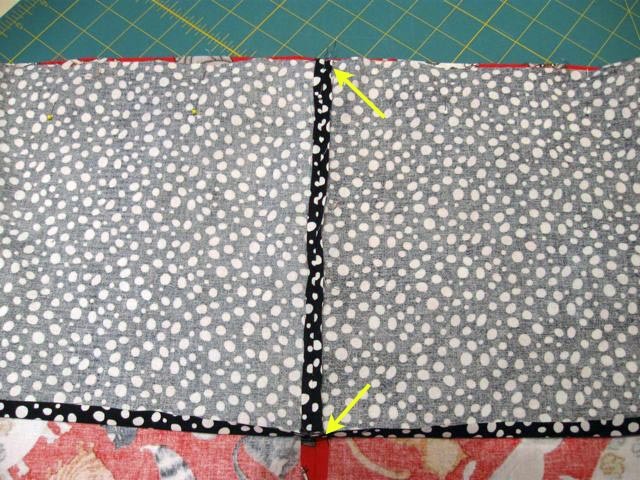 With the right side of the band facing the wrong side of the body, and raw edges and seams aligned, pin the band to the body. (The side of the band with the turned up hem will be free.) Sew the band to the body. Press the seam allowance toward the band. 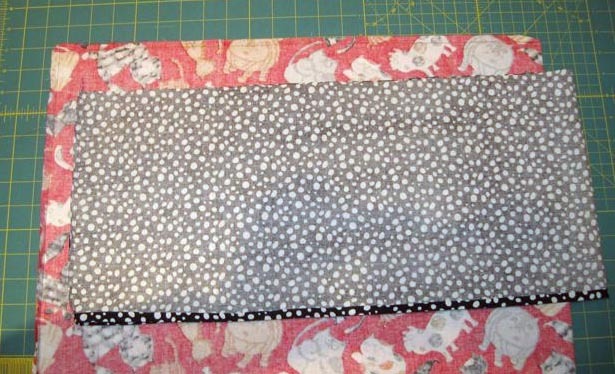 Turn pillow case right side out. Fold over the band toward outside of case. 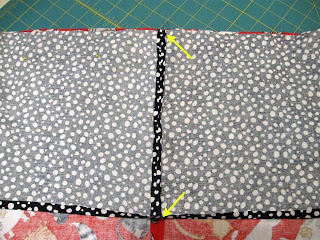 Enclose and cover the raw edges of the seam with the folded-up hem. Pin and top stitch the band in place, close to the hem edge. 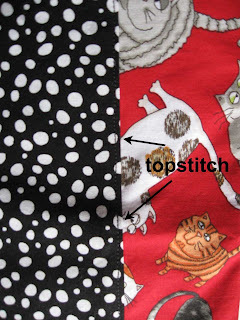 You can use a matching or decorative thread and a straight or decorative stitch. China's red pillowcases (above) and Lucy's pillowcases for Mommy Betty. Here are the finished pillowcases. Lucy thought the grey kitties on the black fabric looked like him. The work is done. Now, go have a snack. You are soooo clever. And I have seven furry friends that love to help with gifts.